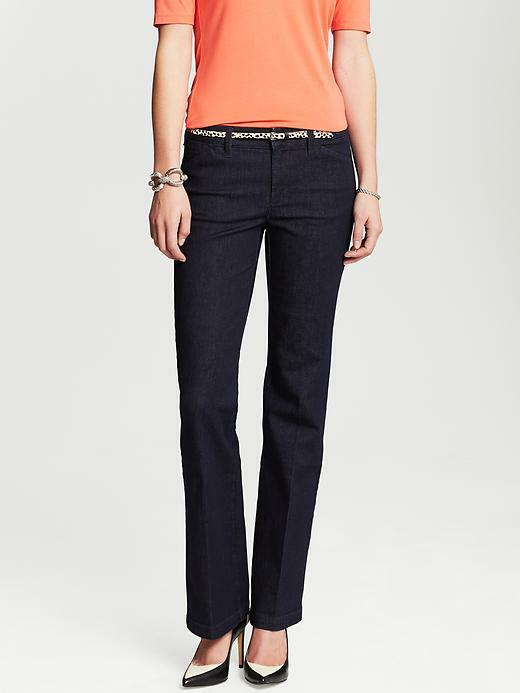 banana Republic Womens trouser & boot cut Jeans Our most dressed up denim boasts a sleek trouser silhouette. Zip fly and button closure. Belt loops. Front off seam pockets. Rear welt pockets. Our denim is made under strict guidelines to ensure that the water used in washing and dyeing is safe and clean before it is released into the environment. Mid rise. Straight through the hip and thigh. Trouser leg. Inseams: Short: 31", Regular: 34", Long/Tall: 37". Model is 5'11". More Canadian Shopping: The Shopping Channel | The Bay | Use Coupon Code: 20OFFBHAF - Take 15% OFF Your Entire order at Boathouse | Expedia.ca: Get $500+ OFF Your Vacation Package at Expedia!